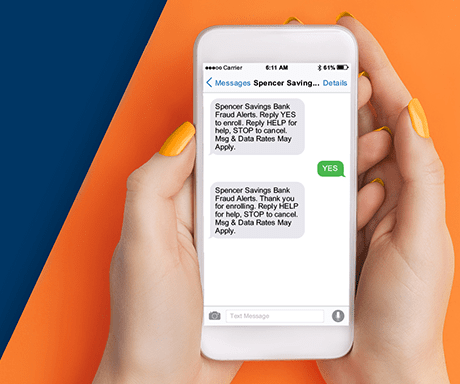 As part of our ongoing fraud monitoring program, Spencer Savings Bank is introducing two-way text alerts to detect suspicious activity in real time. Please opt into these important messages, simply by responding to our text message following card activation. Opting in will allow us to keep tabs on your debit card together. We will text you if we notice a suspicious transaction, and you can instantly respond via text to confirm or deny the transaction. Visit your local branch, or call us at 1-800-363-8115 today!